SkaterBIRD is a sculptural creation of locally-based, internationally-renowned, artist Brad Oldham. It was created at Oldham’s foundry in China, facing a long journey to its destination in Dallas. And how do you transport a massive stainless steel sculpture at 3,500 lbs. 22 feet tall, six feet wide and 10 feet deep? This is where DSV comes in – specifically our local office in Dallas. Executive Vice President, Ole Iversen, based in Dallas, oversaw the transport himself: A Shipper’s Load, Stow and Count via a 40ft open top; blocked and braced. 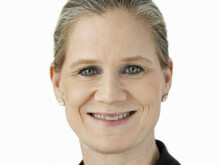 "It’s a great pleasure when what we do makes a difference to the local community. 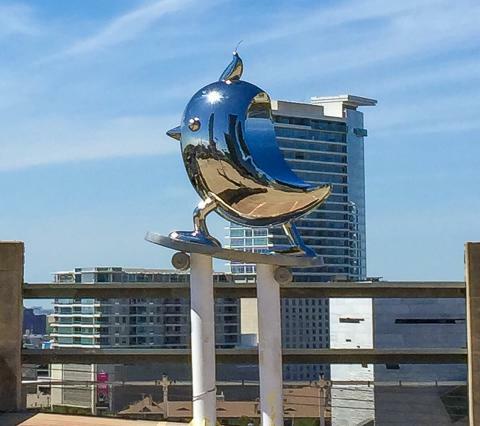 SkaterBIRD is an impressive sculpture, and we’re happy to have played a part in enriching the Dallas skyline," Ole Iversen comments. "It was also a really fun transport job," he adds. The journey took the bird around the West Coast avoiding the massive back-ups from a strike; sailed all-water through the Panama Canal; was slammed with unprecedented weather along the East Coast during vessel rotation; delayed by a Houston Port Canal collision; finally making its way into Dallas without damage or incident. 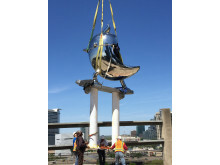 It now resides in downtown Dallas, along with many other well-known sculptures overlooking the skyline. Be sure to look for him on your next migration south to Dallas, Texas. 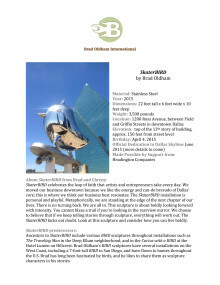 "This sculpture is about boldly looking forward with intensity. You cannot blaze a trail if you’re looking in the rearview mirror… The SkaterBIRD kicks out doubt. Look at this sculpture and consider how you can live boldly," Brad Oldham explains.